Previewed at: Hoyts Cinemas, Broadway, Sydney, on 5 April 2018. 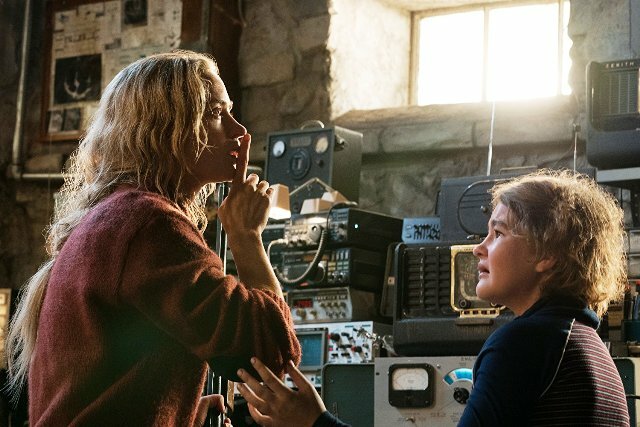 A Quiet Place is yet another film set in a post-apocalyptic world, à la The Road and It Comes At Night, and why not? It’s a good place to let your imagination roam free. Usually in movies like this you’re never quite sure just what caused the apocalypse and, often, you’re also never quite sure what the threat is. In this one, set only a couple of years in the future, true to form we aren’t given any clue as to how humanity arrived at this point but before very long we’re left in no doubt as to what the danger is. Are we seeing more films about aliens invading earth after their own planets have become unliveable out of some sort of guilt, as a reflection of the pretty good job we’re doing of wrecking our own? Possibly - we’re already talking of establishing a settlement on Mars after all. John Krasinski not only had a hand in the screenplay, but he directed and co-produced this reasonably tight horror drama and, as if that’s not enough, he also plays the main character, together with his real-world wife, Emily Blunt. The film opens with ‘Day 89’ emblazoned across the screen as the Abbott parents, Lee (John Krasinski) and Evelyn (Emily Blunt), plus their three kids, are quietly going about their business, collecting goods in an abandoned store. I say quietly because they use sign language and it’s not just to communicate with their deaf daughter Regan (Millicent Simmonds, who is deaf in real-life) and their two sons, Marcus (Noah Jupe) and Beau (Cade Woodward), but because we sense immediately that something ain’t right. There’s no-one else around, the shop is in darkness, and the family are visibly on edge. Pretty much as the audience is by now because so far not a word has been spoken. This sense of foreboding is soon reinforced after a ghastly event occurs on their way back to the family fortress. ‘Home’ is surrounded by hanging lights and contains a basement that’s being used as a research laboratory, where Lee is attempting to upgrade his daughter’s hearing aid while trying to determine how to combat alien beings, flesh-eating hunters that, we realise early on, are sight impaired but have highly acute hearing. This gives them the upper-hand in the survival stakes because the slightest sound puts any other living creature at risk. The story then shifts forward a year and the family are still going about their business trying to lead ‘normal’ lives under these extreme circumstances but now Evelyn is heavily pregnant and, as we all know, new-born babies cry! Krasinski succeeds in keeping his audience in the grip of fear until the very last frame and, despite a few plot holes, the end result is pretty satisfying. It’s a great idea to remove one of the five senses and it’s surprising it hasn't been done more often with hearing. We’ve seen a number of films dealing with the lack of sight but sound? Not so much. The performances are solid and highly believable, especially the child actors. Jeffrey Beecroft’s Production Design is suitably authentic (he worked previously on a couple of the recent Transformer movies) and the tension is heightened by a terrific score from Marco Beltrami. 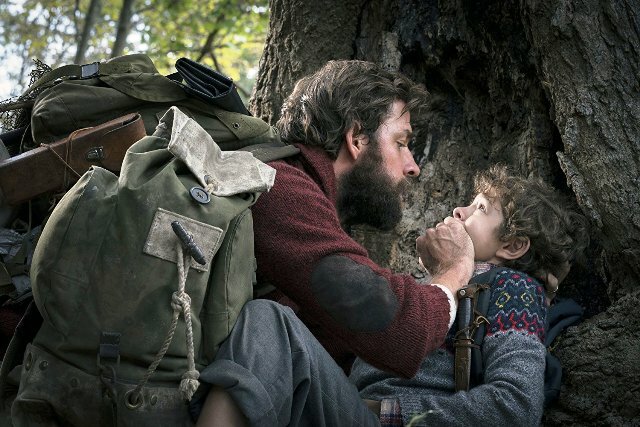 There are many scenes where A Quiet Place gets your adrenalin pumping and it’s worth spending 90 minutes in the dark, if only to enjoy the sense of relief when it is all over and you can return to the real world.